After federal agencies declared Antifa to be a terrorist organization, sources say the Bolingbrook police department will confront the Bolingbrook cell of the anti-fascist group. Though various versions of Antifa, which is short for anti-fascist, have been around since the 1930s, Antifa activities in the US increased following the election of President Donald Trump. Notable actions include shutting down Milo Yiannopoulos’s speech in Berkeley, CA; confrontations with Neo-nazis during the Unite the Right protest in Charlottesville, VA; and an attack against suspected Alt-right members during an anti-fascist counter protest in Berkeley. Emma, who claims to be a member of Bolingbrook Antifa, denounced the alleged crackdown. 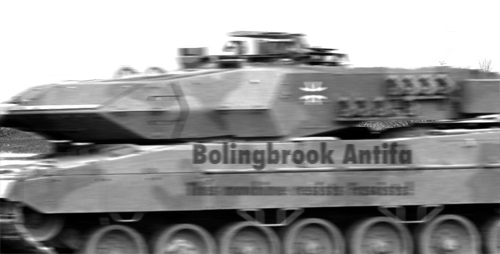 Emma, however, said that they would defend Bolingbrook if racists and fascists marched on Bolingbrook.